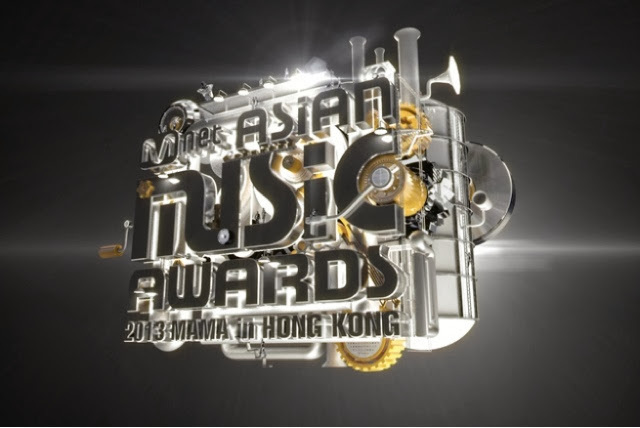 Mnet Asia Music Awards (also more known as MAMA for short) is the biggest music event for Kpop fans around the world, especially in South-East Asia. 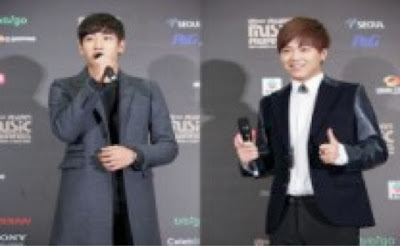 This year MAMA was held in Hong Kong. With the big names (and the not so big names) such as Big Bang, EXO, Lee Seung Gi, Lee Seung Cheol, Girls Generation, Lee Hyo Ri, 2NE1, Infiniate, A pink and Sistar, it was quite the event.. I am glad to watched the live broadcasting on Channel U and Mnet channel on TV. 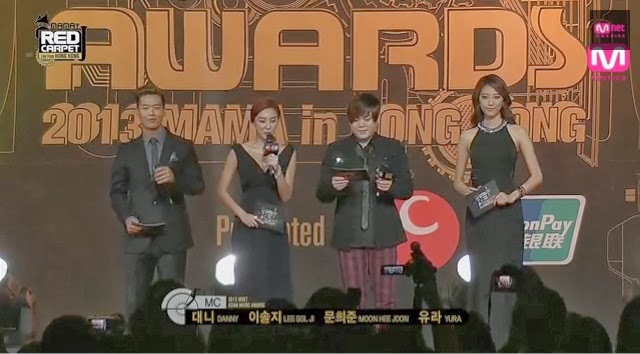 Check out the happenings at twitter #2013MAMA if you have missed this event. Fans were anticipating their favorite artistes to be the winner of the night (and I suspect only, if not not most of, the winners attended). 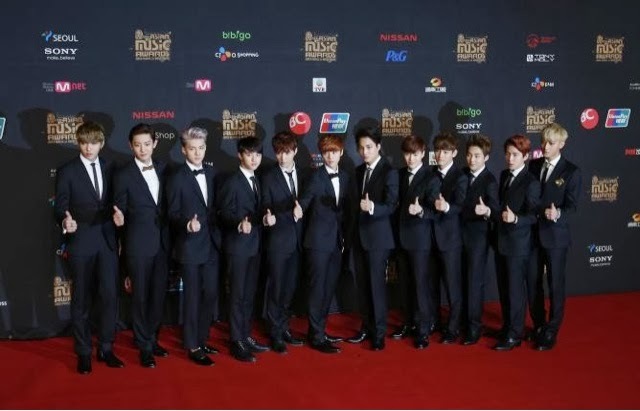 As usual, the stars walked down the red carpet gracefully. The Spartace couple (Kim Jong Kook and Song Ji Hyo - what can I say Kookie!!!) were particularly eye catching in black. As commented by one of the emcees' that night, they looked like Brad Pitt and Angelina Jolie (Korean version). Interestingly, both of them said that they have great anticipation for EXO. After a short interview, they were ushered off to the main venue. 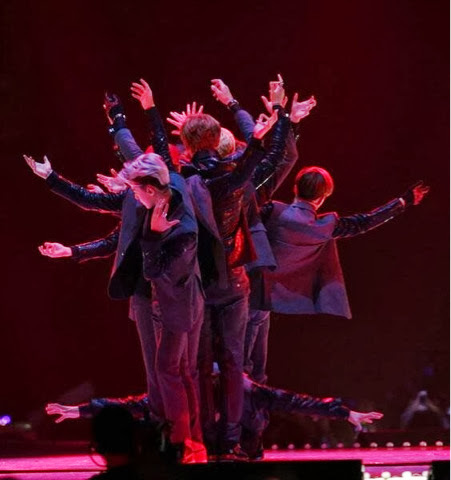 The other hightlight of the red carpet was the entrance of popular boy group EXO which consisted of 12 people selected from different countries. They walked in unison and stormed the event with fans screaming at the top of their voices. With the red carpet having been walked, it was soon time for the event to begin and all the artistes were seated cafe/restuarant style with a table placed in front of them sans the waiters, menus and such. The stage was nicely decorated and the atmosphere was high. 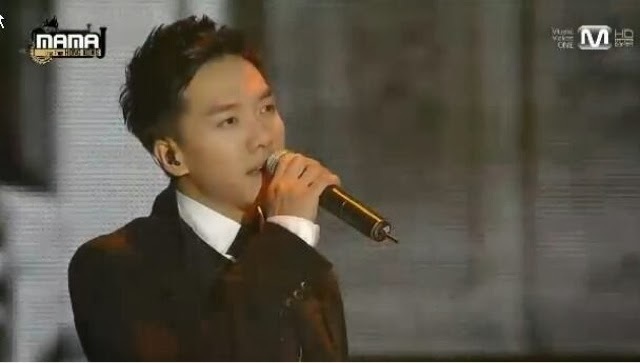 The show began with Lee Seung Gi as the main emcee of the night. I have to admit that I was pleasantly surprised that he is pretty good in English and able to host such a big event. The (first and) best music video award was presented by our my Spartace couple, specially invited to present the trophy to none other than... G Dragon! It was a short appearance by the Spartace couple and they were not seen in the event after that. Well, except for Song Ji Hyo who appeared later and looked 'Mong' (blur) when she announced the next performing artiste - Big Bang! The first performance of the night was Korean duo Trouble Maker - Hyuna and Hyunseung. They lived up to their name, dancing passionately and seductively to the music. Both of them did pretty well to warm up the atmoshpere. Their song item ended with a surprised kiss onstage and the camera immediately zoomed in on Big Bang Seungri astonished expression! The next performance by a new KPop group dance 9 really leave me scratching my head and wonder who are they and are they doing a stunt or dancing? Anyway, they are a relatively unknown group (I think?). Aaron Kwok! This guy still has the grooves! Next, awards were given out to the celebrities in different parts of Asia, with video clips of them saying their thanks and regrets that they could not be there. 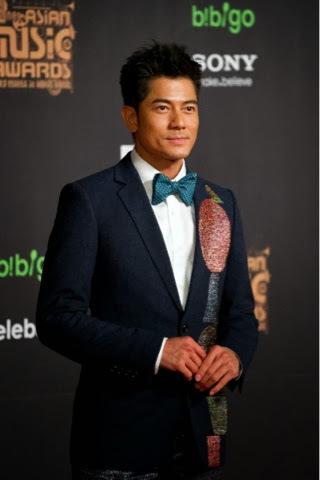 It was soon followed up by a performance by one of Hong Kong Heavenly Kings - Aaron Kwok! He heated up the stage as he belted out his hit song with fabulous dance moves and a stage presence which would give his (younger) Korean counterparts a run for their money! Paris Hilton and G Dragon. I guess Paris is in on the Korean Wave? 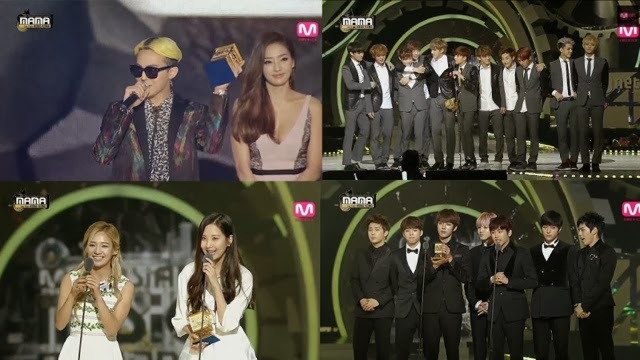 Numerous awards were given out during that night and Big Bang's leader, GDragon was clearly the biggest winner of the night with four awards under his belt. He even had a chance to present an award with Paris Hilton?? Lol... I wondered why Paris Hilton was here. Oh, she also wrapped up the night as the last act; DJing and singing her latest song (she sings?)?? Something that I did not heard of! (Sorry to her fans). 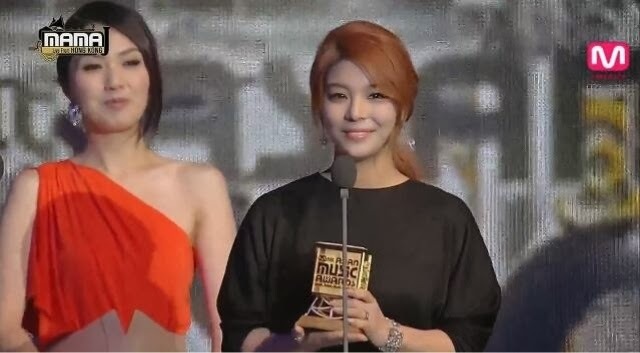 Ailee, who was recently involved in a photo scandal, won herself the best vocal female performance. Looks like the scandal did not have a negative effect on her career, but helped her to get more votes. Although Shinee won the best dance group performance award, they were unfortunately not able to attend. 2NE1 did a marvelous job as usual and officially announce their comeback in the music scene in 2014. Their 'punk' music direction was polished with style and charisma. Just when I thought that MNet had reached its highest with outstanding performance by the artistes, the next performance by Icona pop featuring 2NE1 CL was a letdown. 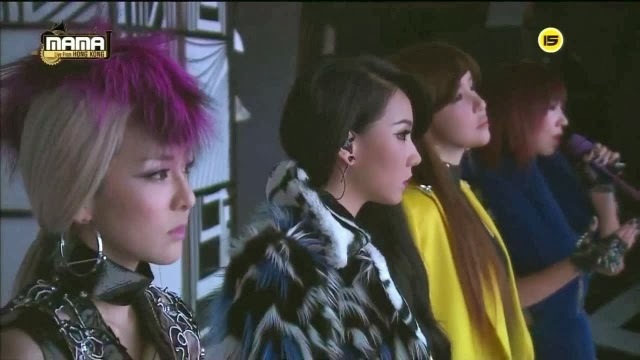 Their weak stage presence could not be saved even with CL's entrance. Finally, just when the performance was over and I thought that the show could not get any worse, the next performance leave me completely 'speechless' (that and the one after it)! The amusing antics singing by comedy comedic duo Ylvis and Crayon Pop is like dumb and dumber. Just like what iceprinxess said, "It sounds like a children's song that went wrong somewhere along the way! OMG.... Don't you think the fox status in the backdrop looks scary? It could be part of a horror flick where the status comes alive and happily eats everyone alive with an evil gleam in its eyes." She even mentioned that she would rather hear the wolf GROWL (in reference to EXO's Hit Song - Growl)! 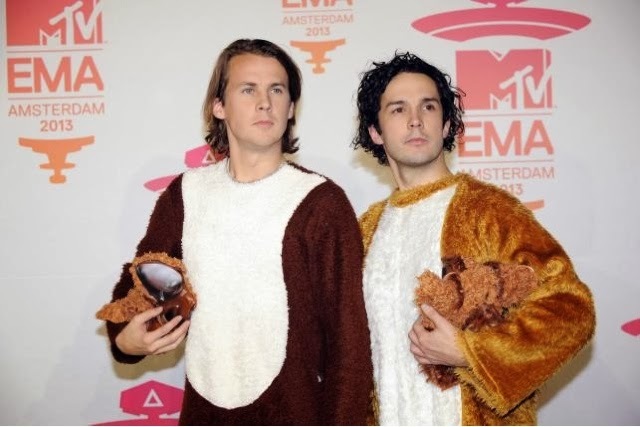 Ylvis mentioned that they were inspired by Psy therefore, they produced a song - 'What does a wolf say?' At least Psy songs are catchy unlike Ylvis who is just a joke onstage. One that is just a fad for the moment. Anyway, that was the worst performance for me. Fortunately, the following acts saved me from switching off the TV after a disgusted and distasteful performance. 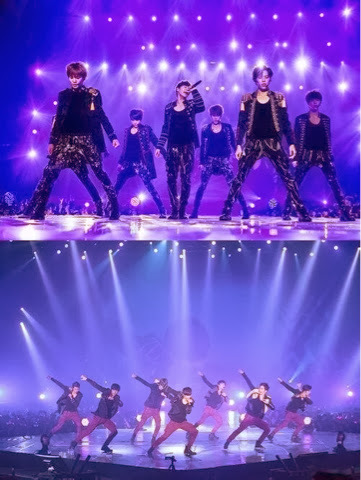 EXO and Infinite saved the day with their slick moves and well choreographed dance steps. They were one of the highlights of the event that night. Next up were Park Jae Jung and Zhu Jia Jia, both winners in their respective countries singing competition (Korea and China respectively). They did well in their performances and their vocal harmonized well for the song - We are Young by Fun, leaving a strong impression. 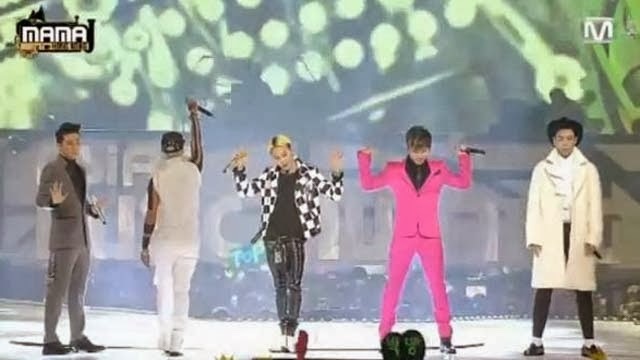 Big Bang stormed the stage with a amazing performances both individually and as a group. They were at their best during the performance of their hit song - Fantastic Baby. Than it was Korean Superstar Rain (Bi) to rock the stage in his comeback performance (and hint of this new album?) after he completed his national service at the army. He sang his hit songs 'It's raining' and 'Hip song' to the delight of the audience especially the ladies. There was only one issue I had have with him and that is his image and dressing (what happened?). iceprinxess and I were discussing, "So guys wearing leggings under a pair of leather shorts a fashion trend in Korea now?" Lee Seung Gi who won the best male performance vocal award on the other hand, gave an average performance with the orchestra that night. I do not know is it because of the sound system or he did not have enough vocal warm up. His voice seemed weak and he could not reach the high notes. Stevie Wonder sang a duet with Sistar Hyorin towards the end of the performance and was later joined in by Aaron Kwok. That was a smoothing ending to a party night. Perhaps, time for the 'party animals' to sleep. Anyway, the biggest winner of the night who won the daesung was EXO who received the award for best album. Some of them were overwhelmed by emotion as they gave their thank you speech. Overall, in my opinion, this event was like a roller coaster ride which went up and down with somethings shocking turns and twists that made me want to switch channels. The pacing and the arrangement of the performances and alternation of award giving was "choppy" and a little confusing at times, giving the impression was not well-planned. At certain times, the sound system was bad. I mean, how could you have a technical difficulty when it was THE Stevie Wonder giving his thank you speech, his voice cannot be heard. Even G-Dragon, Taeyang and Seungri who were on stage to present him with the award were a little at a loss (you could see one of their hands offering their mikes to Stevie Wonder). 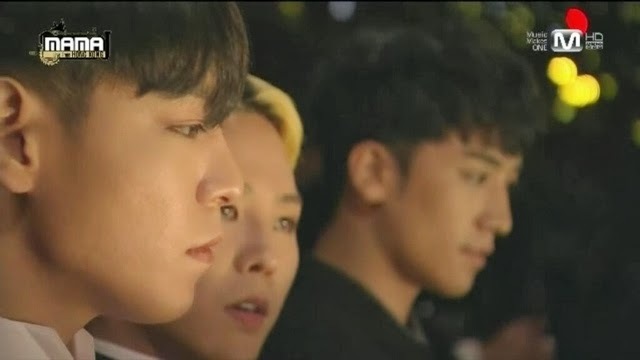 On a side note: G Dragon would be one of the smartest person to have worn a pair of sunglasses that night, he was nodding his head a couple of times throughout the 3 hour (or so show) as if he was enjoying the performances, but whether he was resting his eyes, only he would know. Just like any music award event there are definitely hits as well as misses. The only difference is how many hits and how many misses, and what kinds. We all have different views, so what is yours? Do share with us your thoughts!